GyoiThon identifies the software installed on web server (OS, Middleware, Framework, CMS, etc...) based on the learning data. After that, it executes valid exploits for the identified software using Metasploit. Finally, it generates reports of scan results. GyoiThon executes the above processing automatically. GyoiThon executes the above "Step1" - "Step4" fully automatically. User's only operation is to input the top URL of the target web server in GyoiThon. You can identify vulnerabilities of the web servers without taking time and effort. Step 1. Gather HTTP responses. 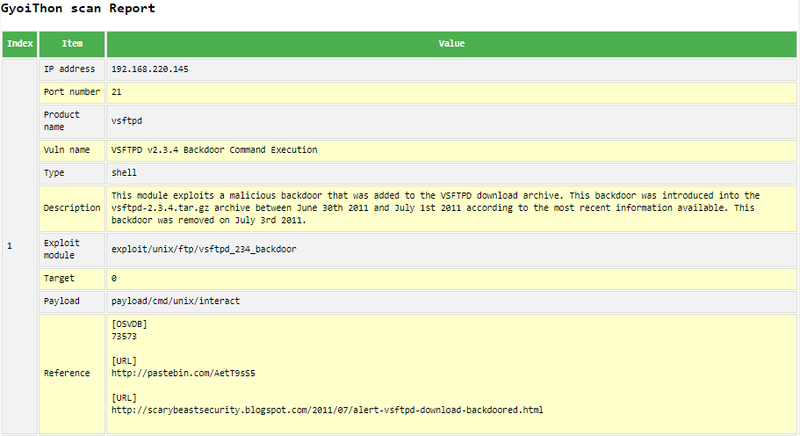 GyoiThon gathers several HTTP responses of target website while crawling. The following are example of HTTP responses gathered by GyoiThon. Step 2. Identify product name. GyoiThon identifies product name installed on web server using following two methods. 1. Based on Machine Learning. By using Machine Learning (Naive Bayes), GyoiThon identifies software based on a combination of slightly different features (Etag value, Cookie value, specific HTML tag etc.) for each software. Naive Bayes is learned using the training data which example below (Training data). Unlike the signature base, Naive Bayes is stochastically identified based on various features included in HTTP response when it cannot be identified software in one feature. GyoiThon can identify the web server software Apache. This is because GyoiThon learns features of Apache such as "Etag header value (409ed-183-53c5f732641c0). In our survey, Apache use combination of numeral and lower case letters as the Etag value. And, Etag value is separated 4-5 digits and 3-4 digits and 12 digits, final digit is 0 in many cases. GyoiThon can identify the CMS Joomla!. This is because GyoiThon learns features of Joomla! such as "Cookie name (f00e6 ... 9831e) " and "Cookie value (0eba9 ... 7f587). In our survey, Joomla! uses 32 lower case letters as the Cookie name and Cookie value in many cases. 2. Based on String matching. Of course, GyoiThon can identify software by string matching also used in traditional penetration test tools. Examples are shown below. GyoiThon can identify the CMS Drupal. Step 3. Exploit using Metasploit. GyoiThon executes exploit corresponding to the identified software using Metasploit and it checks whether the software is affected by the vulnerability. Step 4. Generate scan report. GyoiThon generates a report that summarizes vulnerabilities. Firstly, you initialize metasploit db (postgreSQL) using msfdb command. You launch Metasploit on the remote server that installed Metasploit Framework such as Kali Linux. 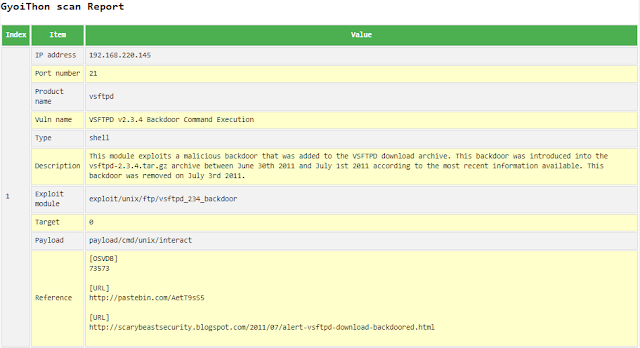 You launch RPC Server of Metasploit following. ServerHost IP address of your server that launched Metasploit. Above example is 192.168.220.144. ServerPort Any port number of your server that launched Metasploit. Above example is 55553. User Any user name using authentication (default => msf). Above example is test. Pass Any password using authentication (default => random string). Above example is test1234. server_host IP address of your server that launched Metasploit. Your setting value ServerHost in Step2. server_port Any port number of your server that launched Metasploit. Your setting value ServerPort in Step2. msgrpc_user Metasploit's user name using authentication. Your setting value User in Step2. msgrpc_pass Metasploit's password using authentication. Your setting value Pass in Step2. LHOST IP address of your server that launched Metasploit. Your setting value ServerHost in Step2. 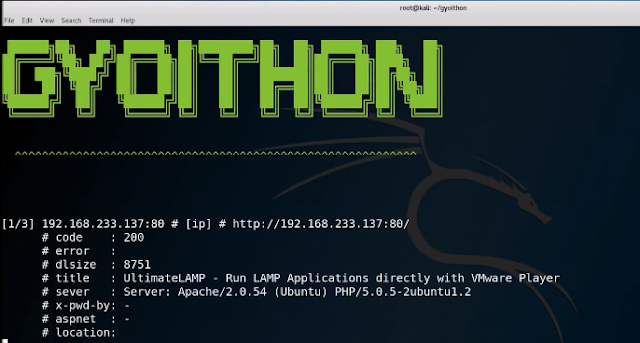 GyoiThon accesses target server using host.txt. So, you have to edit host.txt before executing GyoiThon. You have to separate IP address, port number and target path using single space. Current gyoithon.py is provisional version that without crawling function. We'll upgrade gyoithon.py by April 9. Then, target path will be unnecessary. You execute GyoiThon following command. Please check scan report using any web browser. 1. How to add string matching patterns. signatures path includes four files corresponding to each product categories. It includes string matching patterns of CMS. It includes string matching patterns of FrameWork. It includes string matching patterns of Operating System. It includes string matching patterns of Web server software. If you want to add new string matching patterns, you add new string matching patterns at last line in each file. ex) How to add new string matching pattern of CMS at signature_cms.txt. Above new product name must be a name that Metasploit can identify. And you have to separate new product name and regex pattern using @. 2. How to add learning data. It includes learning data of CMS. It includes learning data of FrameWork. It includes learning data of Operating System. It includes learning data of Web server software. If you want to add new learning data, you add learning data at last line in each file. ex) How to add new learning data of CMS at train_cms_in.txt. And you have to delete trained data (*.pkl). 3. How to change "Exploit module's option". When GyoiThon exploits, it uses default value of Exploit module options. If you want to change option values, please input any value to "user_specify" in exploit_tree.json as following. Above example is to change value of TARGETURI option in exploit module "exploit/unix/webapp/joomla_media_upload_exec" to "/my_original_dir/" from "/joomla".